I truly feel flattered, I have been asked for a tutorial how to make this! 2. 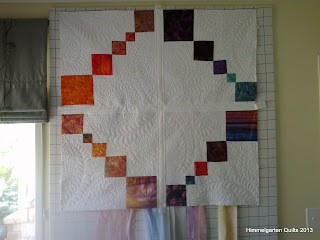 Sew them all together, using a 1/4" seam, alternating one stripe of white, one of black etc. 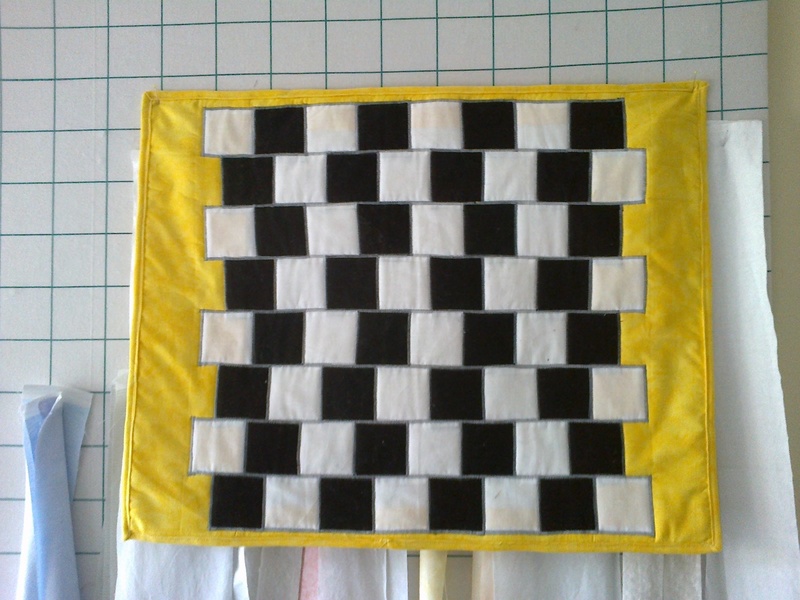 You will end up with a piece of fabric resembling a pedestrian crossing lol, size should be 16 1/2" wide by 20" long. I pressed all seams towards the dark, in retrospect I might have pressed them apart instead. 3. 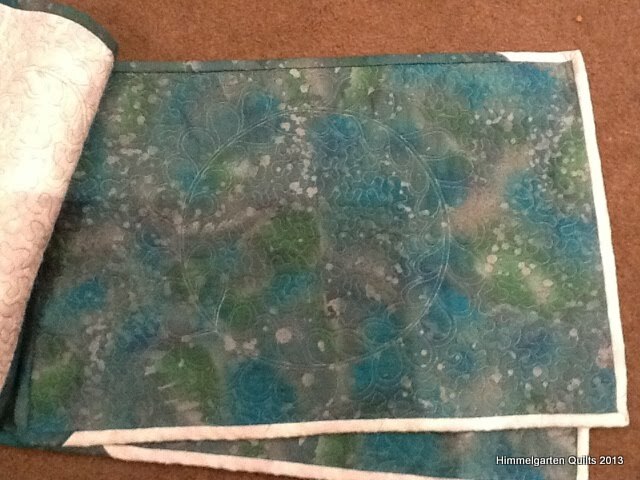 Cut your fabric in 2 1/2" wide strips horizontally. Your strips should now consist of alternating rectangles of white and black. 4. Lay your strips out next to each other. Flip every second one over from left to right so you have one starting with a black rectangle, the next with a white rectangle etc. - the regular chess board pattern. 5. Now you have to offset them against each other before you can sew them. Following the example in DS' Murderous Maths book, I moved every strip starting with a white triangle 3/4" to the left (so rather than matching the seam, my seams are 3/4" and 1 1/4" apart). All strips starting with white should be in the same position, and all the ones starting with black should be in the same position as well. 6. Sew strips together using 1/4" seam in the method of your preference - one after the other, or pairs and then add pairs together. 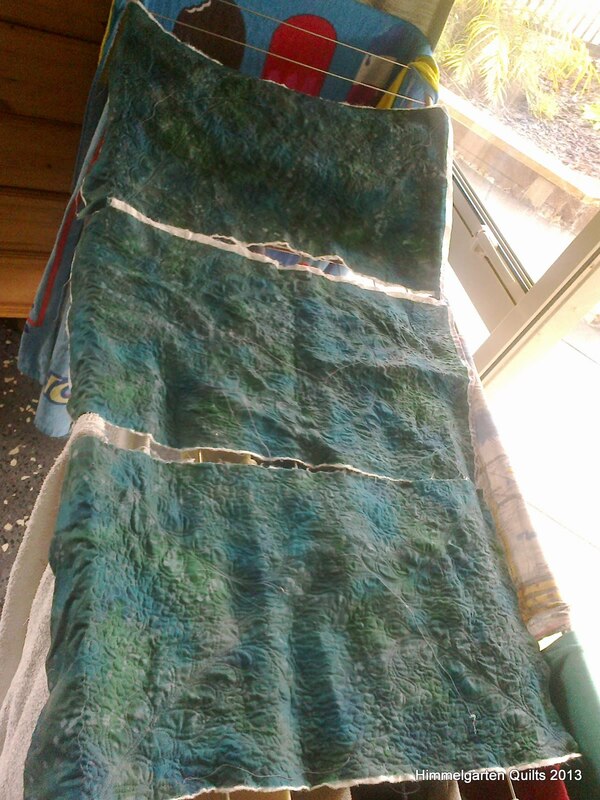 I think I might have done the former, but I seem to recall I flipped it over every other strip, meaning that when you look at the completed piece right side up, one time I would start sewing from the left, next time from the right. It seems to keep the strips from moving too much one way. 7. I decided to applique it to a yellow background, but I only had leftovers to use. 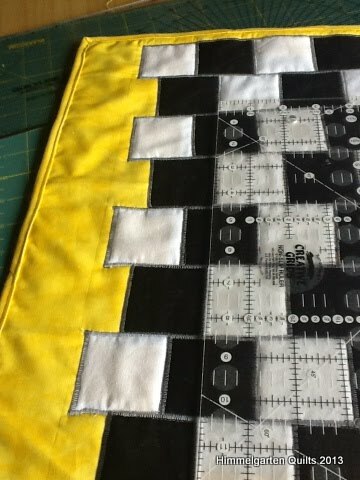 Therefore I chose a left-over piece of batting, in this case cotton-bamboo which I really love right now, approx 22x18", and using sew and flip I first attached narrow yellow strips top and bottom, then wider ones left and right to my batting. 8. Using my recently purchased Hera Marker (I can thoroughly recommend this!) I marked a 1/4" seam allowance on the back of my 'wonky' chessboard all around the edges. Now pin this seam allowance to the back (otherwise the squares on the edges are rectangles and I thought that would look odd) and press. 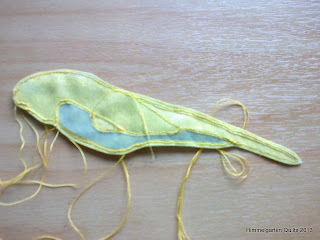 Note: If you have pressed your seams apart, it is a lot easier to do this I reckon! 9. 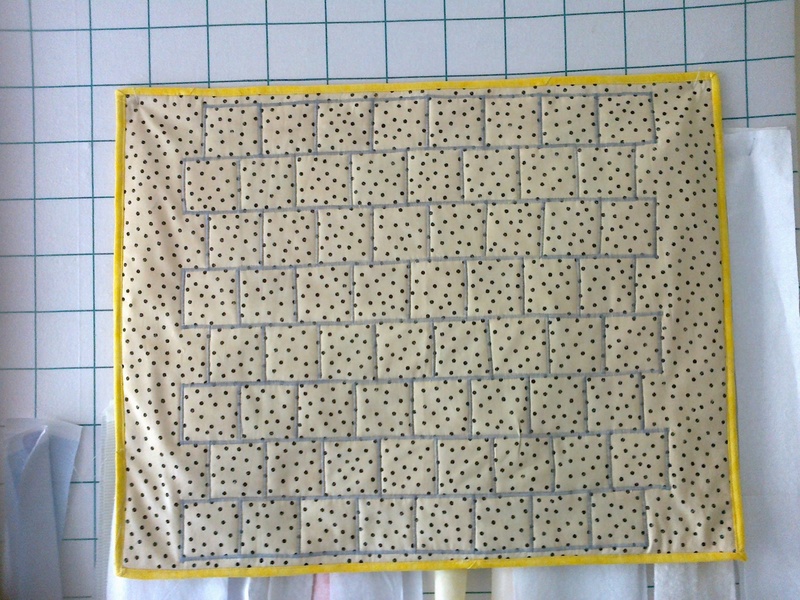 Pin baste backing, batting with yellow background and 'wonky chessboard (I tried to centre mine, you could place it anywhere you like). 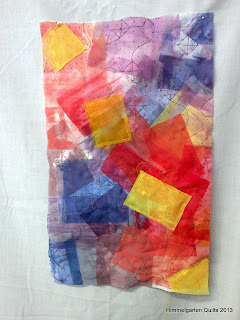 Using grey Aurifill Cotton thread I satinstitched through all layers around all squares. 10. Bind with the method of your preference. 11. Stand back and admire!! I've had such a busy month at work, I can't wait for the Easter break (just 4 more days at school!). Not only are we still screen printing like mad, I have also been to a number of e-learning related courses and now I'm setting up a trial for online teaching for next term. 24h definitely not enough in one day!!! There is next term's topics to plan, a singing group (visiting tutor Tonga Vaea from Three Houses Down!) to organise, students for the student-led ICT conference need to be selected (another teacher is training them up pheww). Well, after we will have won the Lotto Jackpot tonight, something will have to give, and it ain't gonna be the quilting!!! Feeling dizzy :-)? This was made by request of oldest DS who enjoys reading Horrible History, Horrible Science and Murderous Maths books where this was shown. 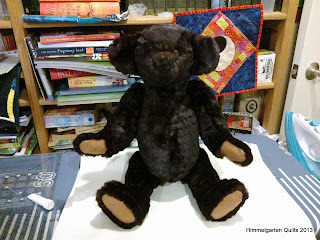 Originally he wanted it as a placemat, but it turned out a bit too big for that. It actually is very simple, because all these strips are of the same width, but the placement of the black and white squares creates this optical illusion when viewed from a distance. 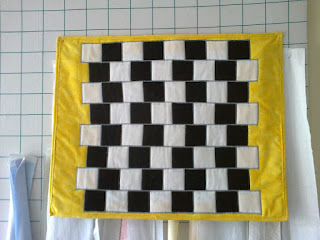 I cut strips of black and white fabric and sewed them together. Next I cut them in stripes the other way. Instead of putting them together with matching corners, I slightly offset them (all the same distance actually). 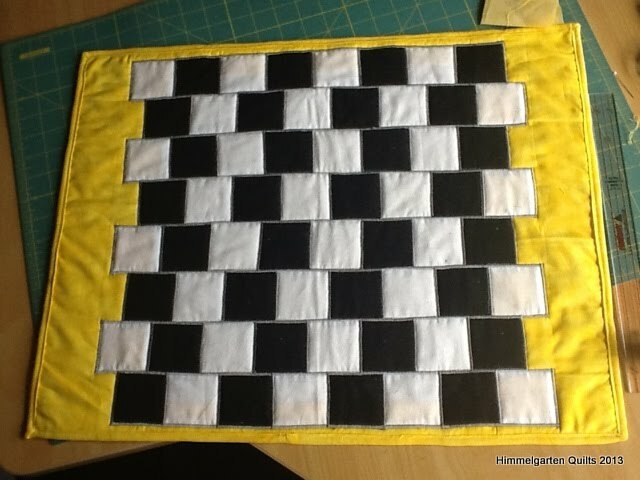 I then painstakingly folded all edges under 1/4" and with satinstitch in grey I appliqued it onto my batting which had the yellow strips already attached (sew and flip). I don't know if you get the same illusion with out the grey stitching around all the squares - we struggled to see it, but only later realised that you need to stand further away. Yellow machine binding around the outside and voila, my March finish! Just to prove that it all is (more or less) straight lines! I quickly need to mention a new tool I am getting to like more and more - my new Hera Marker! 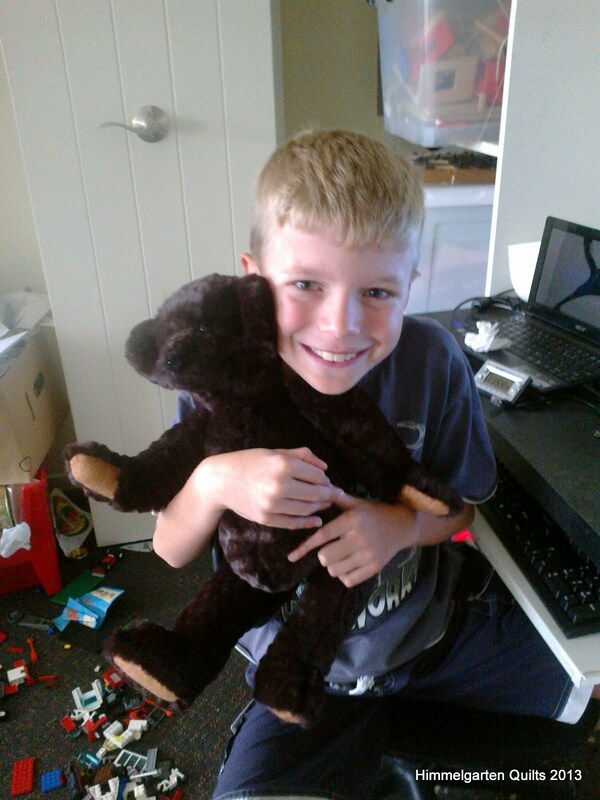 Jeanette DeNicholis Meyer had them at her Whangarei Workshop for use with silk etc. I found them at the Bernina Shop in Whangarei (and saw it after at Spotlight in Whangarei for a lot less :-)) and have been using it to mark straight lines on cotton and on batting, e.g. 1/4" for the machine binding and it works brilliantly! Easy to use and no worries about marks not coming off!!! They seem to come in at least two sizes, I bought the smaller one with pointy tip because that could come in handy for applique I thought. Just 4 more blocks to go on my QD9! These most recent four blocks were not without trials, somehow that white-on-whites had shrunk more than in the previous blocks and I had to add a strip of white to an edge on three of them. 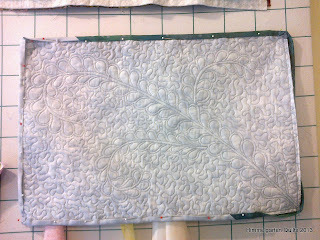 Also, for the first time I had seriously puckered up one backing at a corner (folding the backing back over itself...). 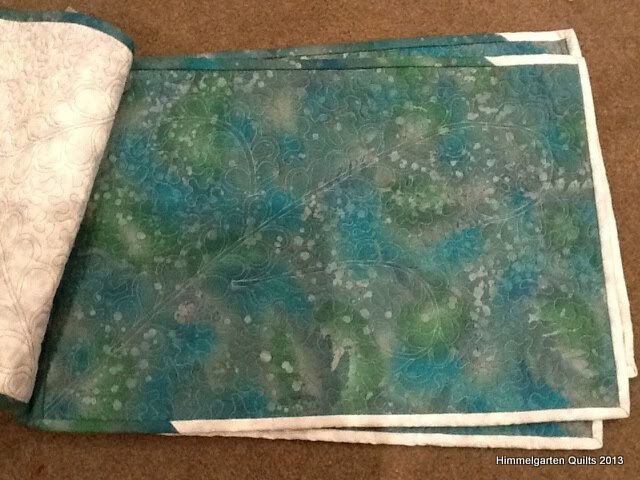 Luckily only a tiny strip of batting visible, and due to using batik I have little concern that the "raw edge" of the fold will fray much. I'll probably handstitch a narrow strip over this. There had to be one more to make it three, topstitching the last binding strip drove me nearly mad, the bobbin ran out, the stitches didn't cover the seam, the bobbin broke etc. etc. I obviously don't do my best work at midnight... Anyway, all done, and I am hopeful that it will get lost in the bigger picture of things. 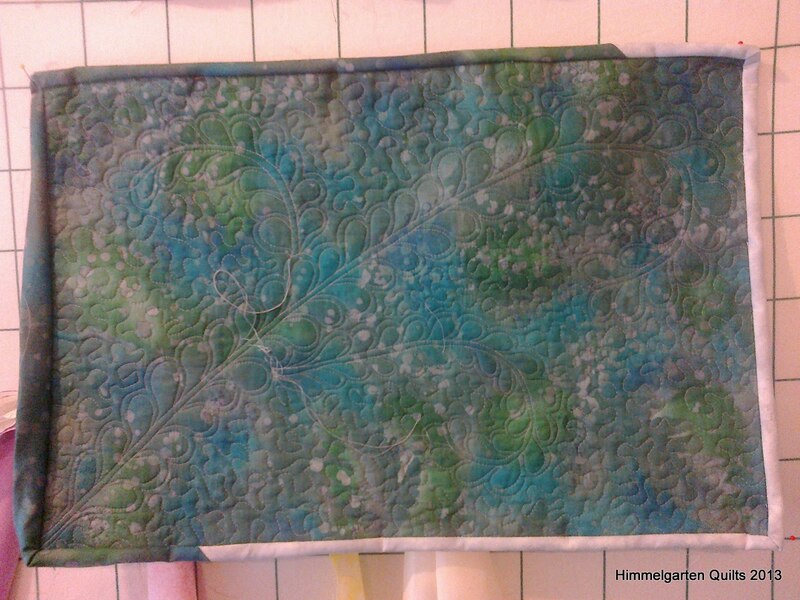 Tomorrow I will try to get the majority of the last four blocks done - stubborn as I am I got it into my head that this will be my March finish for Sew it's finished, so I have to keep going! Yesterday school was closed due to the dreaful weather we have had so I got my placemats finished. I also completed quilting blocks 5-8 of my QD9. The placemats will go to my younger boys' school tomorrow as part of their fundraising batons up. Just another 2 weeks until the Easter break!!! 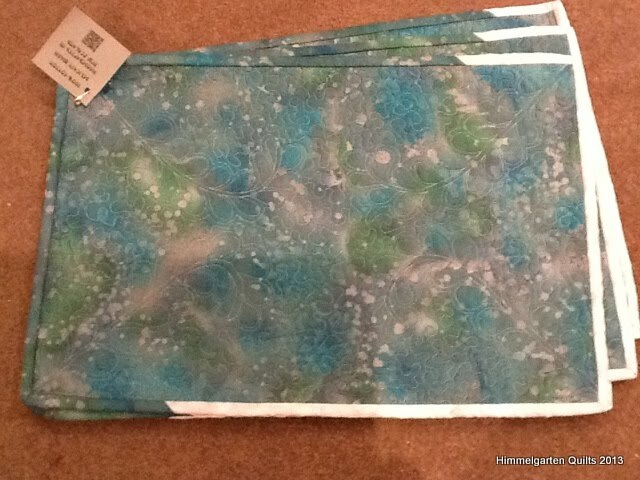 They are meant to be reversible, and every placemat has a different design, all based on feathers though. Tomorrow it's back to the rat race... I have been raking my brain lately trying to come up with an idea of how to get out of the rat race and more into creating?! Didn't win Lotto last night so that's not the solution (yet!). Work has been busy, last weekend was taken up with heaps of fun at Jeannette DeNicholis Meyer's workshop in Whangarei - have a look on the Kerikeri Guild Blog for some more on this - and things have slowed down a bit on the quilting front. Sadly (in my opinion) autumn has arrived, so I have just bottled some pears, and the quinces are simmering as we speak. I have enough preserves already, and since oldest DS was diagnosed with Type 1 Diabetes one year ago today, our consumption of them has decreased a lot. However, I can't stand it to see the fruit go to waste and then buy tinned fruit from say China in the supermarket instead, so I will continue to make good use of what the orchard has to offer! Jeanette's workshop was very interesting. 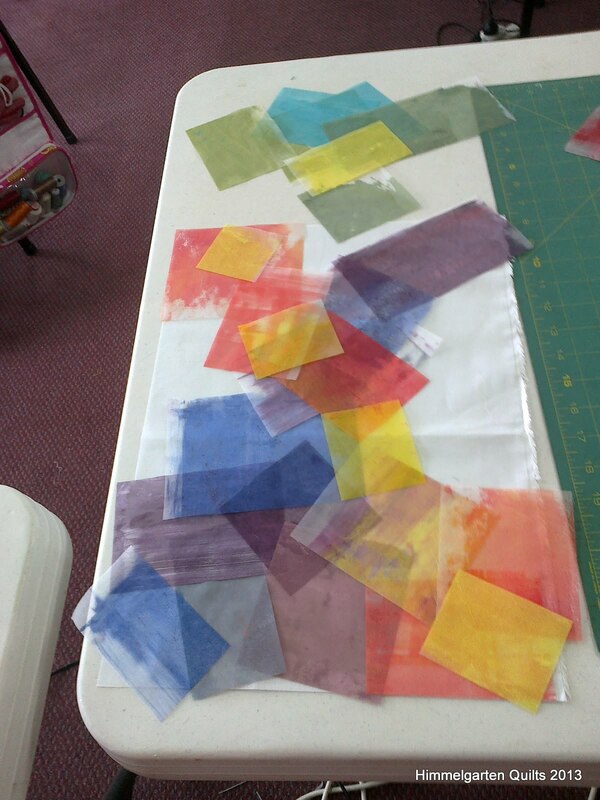 I like making a mess, and I didn't mind at all cutting up my painted silk pieces. At the same time I bought some white cotton sheeting off Miss Lottie, some of it was used as drop cloth and looks quite interesting now, and I intend to try my hand at dying as well as screen print some in the holidays. Working with the silk was interesting and challenging - it was amazing how the colours changed when you changed the order in which you placed fabrics on top of each other! 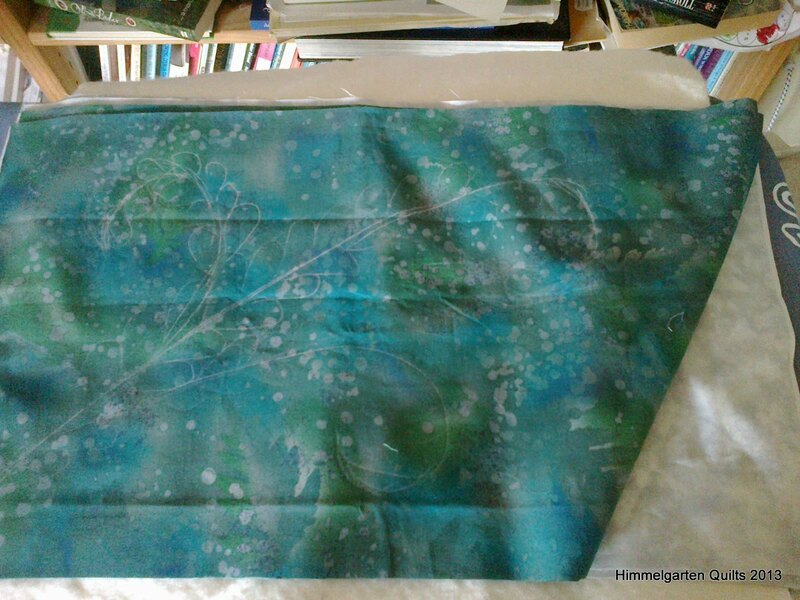 Today my lovely mum gave me her Silk Organza so I will try my hand at this again some time - I have plenty left over from the workshop but I want to have another at some of the techniques we used to use for painting silk scarfs back in the 80s (remember the wet colours running into each other, or what marks rocksalt left on it?). 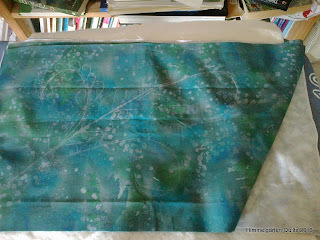 Can anyone tell me if this works on Silk Organza (feels stiffer than what I remember the scarfs were)? The two challenges I find are that silk is slippery (...) and I am worried about washing it. Any advice? 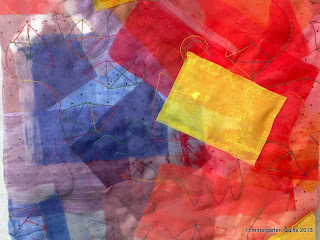 I also want to see if I can transfer this technique to cotton muslin if I starched it to the point that it would lay flat?! Anyone has tried that before? Finished work - it turned out all deep and meaningful in the end, the patterned background provided a grid to free motion stitch my childhood "Das ist das Haus vom Nikolaus" pattern - a house you draw in one continuous line. I continued from there on like a pathway which led to more houses - some small, some big, some wonky, some straight. The path rarely moved in a straight line, symbolising the pathways we take in our life, some times zig zag, sometimes going around in circles but no matter always on a journey. Over the top I raw edge appliqued yellow stepping stones leading who knows where? 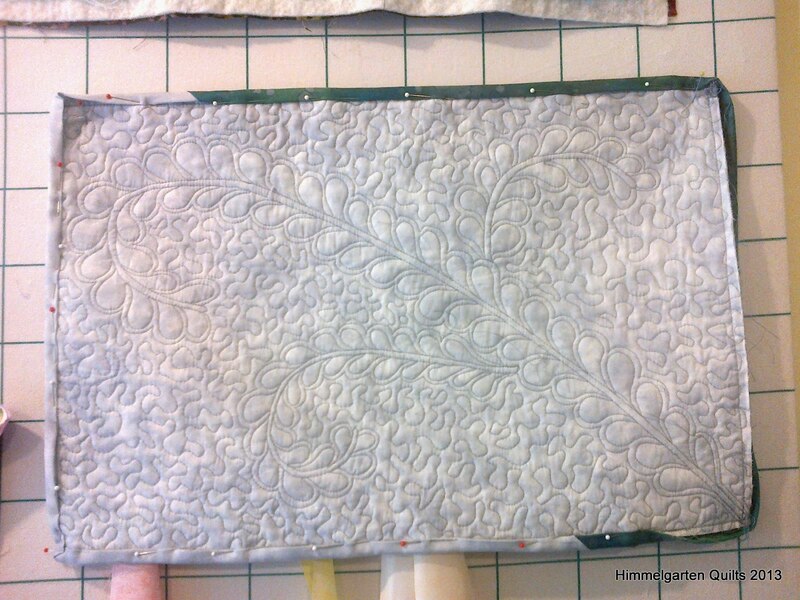 In the meantime, I am still slowly feathering my way through the QD9 - up to block 6 of 16 at the moment (if I want this to become my finish for March I better hurry up!). 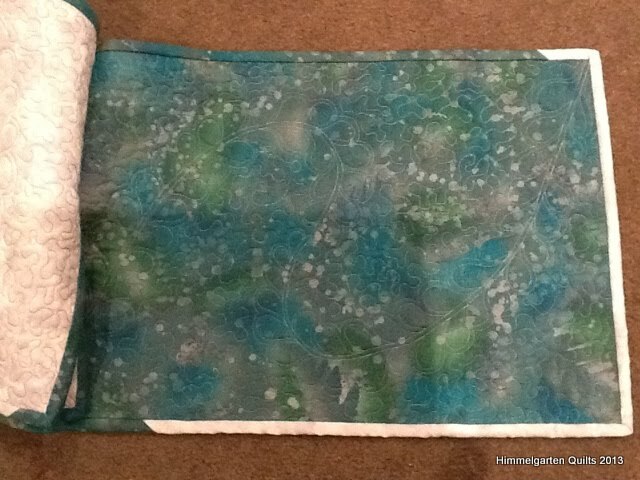 I also need to find a donation for school fundraising - Suz is finishing a lovely quilt top for it this year, she had made awesome placemats last year, so I am looking at placemats this year. Gathering up the various ideas I have read about and played with lately, I am planning to make it 'whole cloth', reversible, with a curly feather with 3 branches and tight stippling in the background. I hope this works on cotton batting - I felt that was the easiest to wash (well, at least in my house they need regular washing!). Fossil Ferns + Moda - will it work?!?! Another little idea I am toying with is a combination of the technique used to make my boys' faces, painted silk, small scale and the birds Wendy over at Sugarlane Quilts had photographed recently. I used a photo of one of the boys' 15 (!) budgies, sketched it on cotton organdy, layered 3 pieces of painted silk on top. From the back I stitched the lines through the layers and using my snips I carefully cut the top layer away where I wanted to show the middle layer, and both layers where I wanted to show the bottom layer. When I get a 'round-to-it', I will find a suitable background fabric (or paint one) and applique the body on, with paint / thread as beak, legs and the twig it sits on, a bead for the eyes. Postcard size. Now imagine actually posting such postcards (in an envelope) and make it a postcard swap?! brought some not so nice weather - I even put on the heatpump this morning, and it's only the beginning of March?! 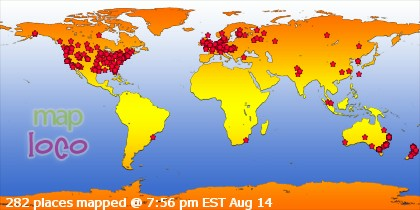 [This blog mentions bad weather too often this year!]. The pinwheel look of the DD9 has given way to a kind of diamond shape - almost like a medallion type design now? Close up of the quilting - I didn't realise I could quilt like this! 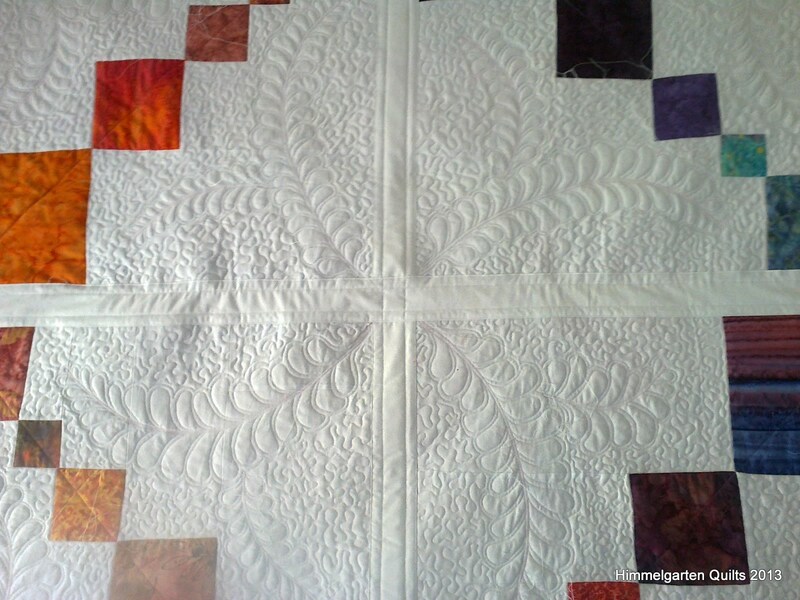 It didn't completely go without hiccups, the various (and lightweighted) white on whites shrunk slightly differently during quilting, the blocks ended up as 20 3/8" cut before joining. 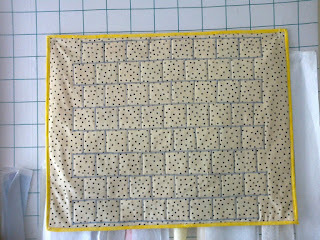 I can't wait to continue on the next four blocks (they're sandwiched and pin basted ready to go).